Shiatsu means “finger pressure” in Japanese. It is one of the oldest forms of healing. With touch it activates your body’s self-healing mechanisms, regenerating the source Qi, or vital life force. Shiatsu is a therapeutic practice based on traditional Chinese medicine and Eastern philosophy. It is also called acupuncture without needles. By working the pressure points and meridians, it activates the body’s emotional, physical and spiritual energy pathways and tries to bring them back into balance. Shiatsu can be deeply relaxing and nourishing. It gives you the space to really let go, connecting the different parts that you may find difficult listening or attending to, offering deep healing. It is ideal to address deep tension within the body. With simple stretches and rotations, a lot of stress held in the body can be released. Shiatsu takes place fully dressed on a comfortable futon mat and lasts approximately 40 minutes to one hour. At the end of the session, I can give you dietary advice (Macrobiotics) and show you simple exercises (stretches, breathing exercises) that you can integrate into your day-to day life. I am a fully qualified shiatsu practitioner (three years training) and registered with the Belgian shiatsu federation. Shiatsu was developed in Japan during the first half of the 20th Century. Newer forms of Western medical knowledge, such as anatomy and physiology, were integrated into older forms of healing, such as traditional Anma massage and diagnosis according to Oriental medicine. Chinese medicine was introduced to Japan by a Buddhist Monk in the 6th Century. 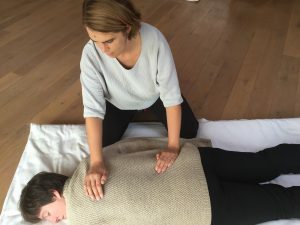 It constitutes a combination of manipulative massage, breathing techniques and healing meditations, known collectively as “Tao Yin”, which formed the basis of what later became shiatsu in Japan. Please get in touch now: call Irene now on (0032)(0) 474 61 29 57 or email her at irene.nolte.email@gmail.com.